Washington, D.C., February 19, 2011 - "The Power of Decision" may be the first (and perhaps the only) U.S. government film depicting the Cold War nightmare of a U.S.-Soviet nuclear conflict. The U.S. Air Force produced it during 1956-1957 at the request of the Strategic Air Command. Unseen for years and made public for the first time by the National Security Archive, the film depicts the U.S. Air Force's implementation of war plan "Quick Strike" in response to a Soviet surprise attack against the United States and European and East Asian allies. By the end of the film, after the Air Force launches a massive bomber-missile "double-punch," millions of Americans, Russians, Europeans, and Japanese are dead. 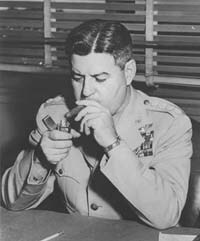 Colonel Dodd, the narrator, asserts that "nobody wins a nuclear war because both sides are sure to suffer terrible damage." Despite the "catastrophic" damage described by a SAC briefer, one of the film's operating assumptions is that defeat is avoidable as long as the Soviet Union cannot impose its "will." The last few minutes of the film suggest that the United States will prevail because of its successful nuclear air offensive. One of the characters, General "Pete" Larson optimistically asserts that the Soviets "must quit; we have the air and the power and they know it." It is the Soviets, not the United States, who are sending out cease-fire pleas, picked up by the CIA. Little is known about the production or subsequent distribution of "The Power of Decision." It was probably used for internal training purposes so that officers and airmen could prepare for the worst active-duty situation that they could encounter. Perhaps the relatively unruffled style of the film's performers was to help serve as a model for SAC officers if they ever had to follow orders that could produce a nuclear holocaust. This item was obtained and uploaded by the National Security Archive - http://www.nsarchive.org - an independent non-governmental research institute and library located at The George Washington University. Use is authorized in accordance with Creative Commons license and with credit to the National Security Archive. Coverage of simulated war plan action, in the event of an attack, which was executed at the Operation Control Room, Offutt AFB, Nebraska, and at the underground control room (location SECRET), by Strategic Air Command. Footage includes pilots and ground crewmen scrambling; pilots boarding aircraft; B-47's, B-52's, and B-58's taxiing, taking off, maneuvering, and landing; and a KC-135 refueling a B-52. Also included are scenes of the launching of the Bull Goose, Rascal, Snark, and Thor missiles.